Scroll for a selection of news featuring Framework. For more join us on Facebook. There are a number of new timber buildings that are supposed to start construction next year or in a couple of years' time. So in terms of new trends that are picking up steam, that's something we're expecting to be seeing more of. In June, the city issued building permits for the Framework Project, a 12-story (148- foot) mixed-used building constructed mainly with sustainably harvested engineered lumber. To get the permits, developers had to submit designs that passed rigorous fire, seismic and other safety tests to prove its durability was comparable to typical steel and-concrete construction. Scheduled for completion in early 2019, Framework will house 60 affordable apartments along with a mix of retail and office space. Sustainability has become a core principle of architecture and construction in North America. Winners of the LafargeHolcim Awards for Sustainable Construction presented in Chicago show how the leading edge of sustainable design means reaching far beyond “common sense”. And by the end of this year, architects in Portland, Oregon, will break ground on a 12-story mixed-use structure dubbed the Framework, which will be the tallest wooden building in the US once it's complete. It should be complete by 2019. City officials in Portland, Oregon, have approved a construction permit for the first all-wood high-rise building in the nation. Developers announcing the approval Tuesday say it's a milestone for wood technology. State officials hope it could help parts of rural Oregon reboot a dwindling timber industry. Timber is becoming an increasingly attractive construction material thanks to advances in wood-binding technologies. 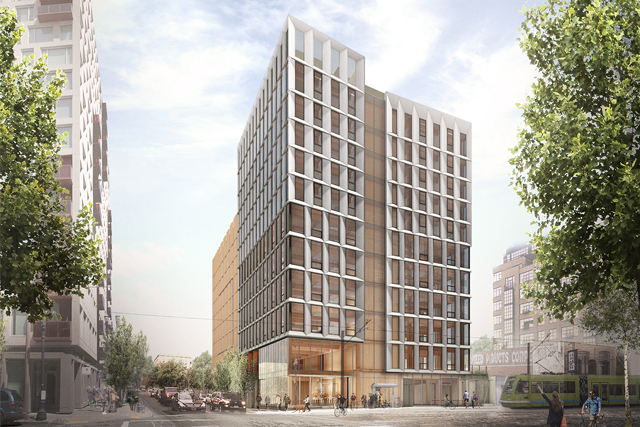 This week, city officials in Portland, Oregon, approved a construction permit for the United States’ first all-wood high-rise. 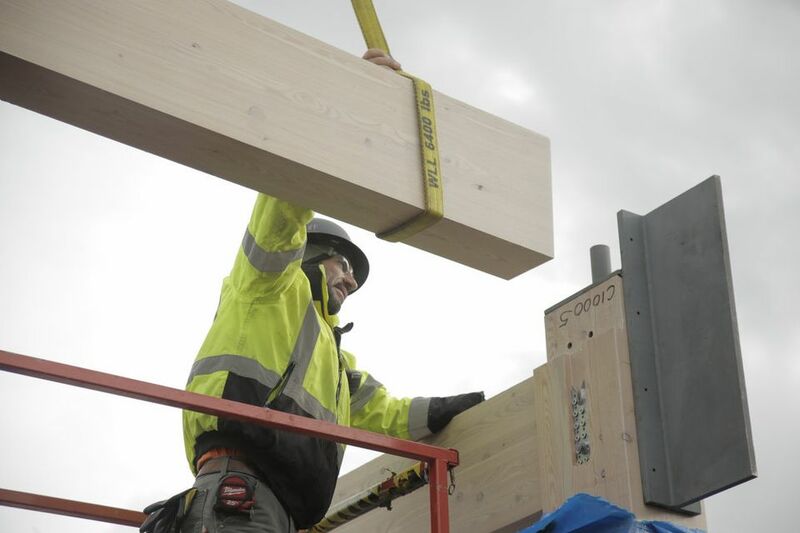 Officials in Oregon have approved construction permits for the first all-wood high-rise building in the nation. Construction on the 12-story building, called Framework, will break ground this fall in Portland's trendy and rapidly growing Pearl District and is expected to be completed by the following winter. The decision by state and local authorities to allow construction comes after months of painstaking testing of the emerging technologies that will be used to build it, including a product called cross-laminated timber, or CLT. For Oregon, cross-laminated timber represents a chance to revive the moribund wood products industry, restoring logging and manufacturing jobs in rural communities — where the state's natural resources give it a clear advantage over foreign competitors. The state is investing hundreds of thousands of taxpayer dollars to promote CLT. Right now, only a handful of buildings in the U.S. have been built with it, and most are in Oregon. Portland Monthly: The Future of Portland’s Skyline is Made of Wood. Yes, Wood. For thousands of years, people built with wood. But with the Industrial Revolution came steel, strong enough to support skyscrapers. Starting in Austria about 20 years ago, however, two technical advances allowed stronger, taller wood buildings than ever before—even skyscrapers. For one, engineers improved structural connections between walls and floors, making timber-framed buildings better able to withstand earthquakes. More significantly for Oregon’s emerging generation of wood buildings, builders began using cross-laminated timber, or CLT: manufactured panels created by gluing together layers of wood, then compressing them into a packed structure as strong, pound for pound, as steel—construction-wise, a kind of Holy Grail with splinters. Building Design + Construction: "Mass timber: From 'What the heck is that?' to 'Wow! Proponents cite the speed at which tall buildings can be constructed using pre-engineered wood and mass timber’s ability to sequester carbon. Joey-Michelle Hutchison, RA, LEED AP BD+C, CSBA, Associate Vice Principal, CallisonRTKL, says, “The role of mass wood is going to grow because of the demand for sustainable design.” Researchers from Yale and the University of Washington, in a study published in the Journal of Sustainable Forestry (March 28, 2014), postulated that using wood substitutes for constructing buildings (and bridges) could save 14–31% of global CO2 emissions. “The early adopters are looking at it and seeing it as a good opportunity,” but before CLT can take off, there will have to be more examples to get people excited and more mills producing it, said Thomas DeLuca, professor and director of University of Washington’s School of Environmental and Forest Sciences. Since 2010, there have been more than 17 seven-story or taller mass-timber buildings constructed outside the U.S. The tallest is a 14-story residential building in Bergen, Norway. There are no tall-timber U.S. buildings, primarily because of regulatory resistance. The mixed-use Framework aims to change that. “I would say by far this is the most stringent testing that’s been done with this type of assembly,” he said. “Most the testing that’s been done in Europe is to 90 minutes, so this would be the first time that beam to column and floor components have been tested to two hours.” The tests show CLT’s compliance with building code sections regarding flame spread and fire rating requirements, Robinson said. The test specimens were fully loaded, meaning that during the test a load was applied by a hydraulic actuator on top of the components being tested, he added. Perhaps most encouragingly of all given our current fears about a major Cascade Subduction Zone earthquake coming, this generation of timber framing is more seismically resilient than other methods, because wood buildings can sway with the shaking ground. Lever’s Framework building starts with a wood core strengthened with steel tensioning, a rigid backbone to which the more flexible outer floors and walls are tethered. The Smithsonian: Will Skyscapers of the Future Be Built From Wood? Portland, Oregon, home to all things craft and micro, is emerging as the hub of a potential construction revolution that relies on materials from a century ago. Buildings as high as 12 stories made from wood—or, more specifically, multilayered wood panels such as cross-laminated timber engineered from Douglas fir cut down in the state’s forests—are cropping up across the city with hopes of spurring new projects here and across the country. Erecting tall buildings—normally the domain of steel or concrete—with engineered wood, or “mass timber,” has already been done in Australia and Europe, but this type of construction is nearly nonexistent in the United States. Proponents of cross-laminated timber and other mass timber products say it could create demand for the woody material clogging overgrown forests, especially in the West. Creating a market for small-diameter trees or diseased or burned forests by turning it into a high-value building material would create jobs, something once-great rural paper mill towns desperately need. CLT is nothing new, however. It was invented in the 1970s in Switzerland as a sustainable alternative to concrete, masonry, and steel construction. As such, CLT buildings have cropped up in Scandinavia, Austria, Germany, the UK, Australia and Canada, from commercial high rises to modular construction in housing and classrooms. But only recently has CLT reached the United States. Portland Mercury: The World's Most Sustainable High-Rise Construction Material Is... Wood? PORTLAND IS GROWING UP—adding high-rises, increasing density, and pricing many people out. But two local firms are exploring a state-of-the-art building material that could help solve the city's affordability problem, create living-wage jobs in rural communities, and help save the planet. It's wood. While there have been basic design principles used in mass-timber construction in Seattle and Portland — in the form of five-story warehouse buildings from the early 20th century — the new CLT design harnesses technology that can take smaller-dimensional timber and build them into large beams or columns. Building taller and larger structures with wood has only become possible in recent years, as the industry has created denser, engineered wood products that are more flexible, stronger, and more fire resistant than the traditional two-by-four beam. But current U.S. building codes generally allow wood buildings to be only six stories or less, and regulators and designers are naturally wary of trying new methods. The goal of the competition is to demonstrate it can be done. A tall wood building, though, will require jumping through regulatory hoops that don't exist for four-story buildings. The team designing and developing Framework, the name of Beneficial's mixed-use project, must prove that CLT holds up to earthquakes, fire and noise requirements. The $1.5 million from the USDA will help go toward alleviating those costs. Not only will it help pave the way for possibly the first CLT 12-story building, but it will create a set of data about how CLT stands up to regulations for other developers to use in their own CLT projects, if the industry grows, as industry and government officials hope it will. The “forest to frame” philosophy behind the building reflects its relationship between urban construction and rural lumber manufacturing. This project creates more opportunities in both industries, which were gravely affected in the recession. “Framework stands as a model for sustainable urban ecology,” says Robinson. And there are copious environmental benefits: Buildings made primarily of wood have significantly lower carbon emissions and use less energy than those made from traditional materials.